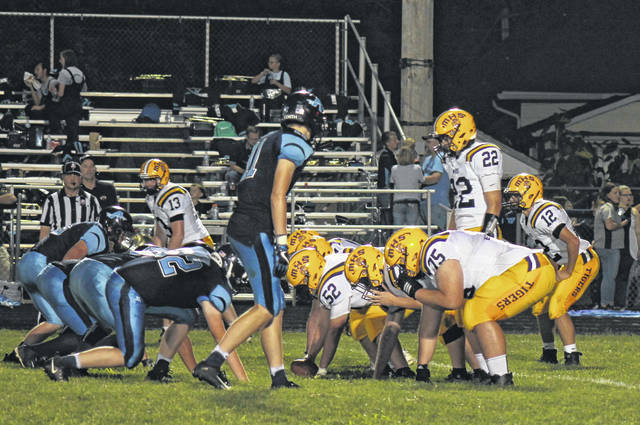 McClain starting quarterback Dalton Mischal surveys the defense before snapping the ball Friday night at Adena High School in the Tigers’ opening game of the season. What began as a tightly contested football game ended with a lopsided 31-15 victory for the Adena Warriors who hosted the Greenfield-McClain Tigers to open the season. McClain received the ball to begin the game and on the first play from scrimmage saw a 46-yard carry for starting quarterback Dalton Mischal. Unfortunately, the Tigers opening drive stalled as they turned the ball over on downs to give the Warriors the ball at their own 27-yard line. The Warriors were able to move the ball nicely on the ground in their opening possession, but turned the ball over on a diving interception by defensive back Eric Anderson to give the Tigers the ball on their own 22-yard line. After a three and out by the Tigers offensive unit, the Warriors continued to march down the field on the ground. The Tigers defensive was able to dig in when they needed to, however, only allowing a field goal to give the Warriors a 3-0 advantage. On the Tigers ensuing possession, Colton Mossbarger hit the second big play of the first have on a 30-yard run. The very next play, however, the Warriors were able to recover a fumble by Tigers running back Ethan Taylor to maintain momentum. After drives by each teamed stalled, the Warriors extended their lead to 10 with a touchdown run by Nate Throckmorton. The Tigers needed a big play and they got one on an 85-yard kick return for a touchdown by Mossbarger. However, the Warriors reclaimed momentum just before halftime as Preston Sykes completed his first touchdown pass of the season to Caleb Fogelsong to take a 17-7 lead to the halftime break. The Warriors came out of the locker room with much better execution than that of the first-half. Receiving the ball to begin the second half, the Warriors kick-returner took the ball all the way down to the Tigers 25-yard line, which led to a two-yard touchdown run a few plays later to extend the lead to 24-7. After a three and out by the Tigers, the Warriors continued to pick-up yards on the ground and, again, found the goal line to push the lead to 31-7. The Tigers refused to quit despite facing a sizable deficit early in the fourth. Instead of sticking to their usual ground attack, the Tigers opted to go with an aerial attack and picked up pass plays of 45 and 28 yards. Near their opponent’s goal line, Tigers quarterback David Jett punched the ball in from just over two-yards to cut the deficit to 31-15. With the Warriors keeping the ball on the ground and time continuing to tick off the clock, the Tigers couldn’t pull any closer and dropped their opener on the road by a final of 31-15.
https://www.timesgazette.com/wp-content/uploads/sites/33/2018/08/web1_Mischal-vs-Adena.jpgMcClain starting quarterback Dalton Mischal surveys the defense before snapping the ball Friday night at Adena High School in the Tigers’ opening game of the season.